If you like this ezine, please do a friend and me a favor and pass it along. As you are probably aware, there are literally dozens of diet plans on the market. One diet plan which is currently getting a lot of television time is Jenny Craig. The Jenny Craig diet plan is based on the 2005 federal guidelines and the USDA's (United States Department of Agriculture) food pyramid. NutriSystem is another weight loss program getting a lot of air time. This program supplies pre-packaged meals which can run several hundred dollars a month. The Journal of the American Dietetic Association recently ran a report ranking ten diets based on nutritional quality and their potential effects on heart health. The evaluation of the diet plans was based on the Alternate Healthy Eating Index (AHEI.) AHEI has a maximum score of 70. It looks at the amount of fruits, vegetables, fiber, and the ratio of polyunsaturated fats to saturated fats each plan supplies. This study was undertaken by Dr. Yunsheng Ma, lead author and assistant professor of medicine at the University of Massachusetts Medical School located in Worcester. Says Dr. Ma, "Obese people already have a higher risk of heart disease so it's particularly important that they make heart-healthy diet changes that can be kept up for the long haul." The criteria for weight loss plans is very important since the leading cause of death in America is heart disease. Heart dieseae is followed closely by cancer. All of the top ten ranked diet plans include high amounts of fruits, vegetables, and fiber. Weight Watchers is the largest commercial weight loss plan in the United States. Ornish is basically a vegetarian diet plan but allows some non-fat dairy and egg whites. Developed by Dr. Dean Ornish, it was devised to specifically address heart disease. The 2005 Food Guide Pyramid plan overemphasizes grains at the expense of heart-healthy fruits and vegetables which are loaded with fiber. It also doesn't limit saturated fat intake. As far as the nutritional aspect of weight loss is concerned, I recommend home prepared meals instead of pre-packaged meals. No it is not as convenient as ripping open a portion-controlled food package. But you will not only save money by buying the basic ingredients yourself, the meals will be more nutritious. You will also be able to make your meals to suit your taste by preparing them yourself. Just adhere to basic nutritional principles. Use whole food ingredients such as 100 percent whole grain spaghetti, macaroni, cereals, and bread, and eat plenty of organic fruits and vegetables. The Cable News Network, better known simply as CNN, ran a series of reports entitled Fed Up: America's Killer Diet. It was hosted by Dr. Sanjay Gupta. This program explained why America is overweight, and growing more overweight with each passing year. Although the program focused specifically on America, the problem could equally apply to almost every nation around the world. America's, as well as the rest of the world's, overweight and obesity epidemic is fueled in part by their citizens' uncontrolled eating. I remember when I was growing up that if I or one of my brothers or sisters asked for a second helping, and couldn't finish eating it, my mother would tell us that our eyes were bigger than our stomachs! This is a big part of America's problem. Its eyes are bigger than its citizens' collective stomachs, and it seems that we are powerless to do anything about it. Food convenience is a powerful trigger. Right alongside the family style meals with serving bowls lies the all you can eat restaurants dotting the landscape. Many think buffet style restaurants are the greatest thing since mom's apple pie. There is a darkside however. Convenience is a psychological pitfall which promotes bulging bellies. Convenience is ever so convenient! Brian Wansink conducted an experiement where he placed candy jars in office workers' cubicles, and kept them there for a month. He then moved the jars 6 feet away. The office workers ate 5 more pieces of candy a day when the jars were in their cubicles. That added an additional 125 calories per worker per day. That translates into 12 pounds over the course of a year! Family style meals with serving bowls on the table, and the increase of buffet style restaurants makes it very easy to overeat. Even a disciplined person like myself has to be careful in this type of environment. We also tend to overeat when we eat straight from a container instead of taking out a certain portion. My weakness is ice cream. I can eat a half-gallon at one sitting. Now when I do indulge, I buy a pint container instead of a half-gallon container. Food and beverage containers have grown tremendously since I grew up in the '50s. Drinks are now supersized and theater popcorn comes in huge bucket-sized containers. Even dinner plates have increased in size. They have grown so much that they could more aptly be called platters. When I was a youngster growing up in New Jersey, eating in front of the television set was a no-no. So was eating in the car. Nowadays they are the rule with very few exceptions. Food is all around us. There are convenience stores on every street, packed with candies, cookies, soft drinks, chips of all varieties, and baked goods and pastries. Convenience stores and fast food restaurants are also located in gas stations, airports, and hospitals. Junk food laden vending machines are in our school systems causing constant temptation for our youth. The more we eat, the more we want to eat. Eating is a compulsion because America is addicted to the excess sugar, artificial sweeteners, and sodium in these cheap products. These ingredients, in addition to monosodium glutamate and excess omega-6 fatty acid, damage the hormones which control hunger, satiety, and fat burning and fat storage. The problem with today's processed food is twofold: (1) vital nutrients have been removed or reduced (fiber, vitamins, and minerals.) This is even the more tragic because the produce we now harvest is not as nutritious as it was 50 to 60 years ago and (2) dangerous chemicals are added. These chemicals disrupt the human body's hormone communicators contributing heavily to the current, ever-growing obesity crisis. What can be done about this calamity? Know first of all that the solution lies in your hand. Don't sit back and wait for the governemnt to do something about it. And it doesn't matter what nation of the world you live in. If overweight and obesity rates are growing in your country, you are affected. Return to the healthy diet of your ancestors. That means giving up processed food and returning to organic fruits and vegetables. I know today's food is convenient, but convenience is putting you at risk for chronic disease, and an early grave. You have to give up convenience for the sake of your health and welfare. Not only did your ancestors eat much more nutritiously than you do, but they were a lot more active. It is imperative that you carve some time out of your busy schedule to exercise. As it is with nutrition, exercise is non-negotiable. You can start by walking more. This includes taking the stairs instead of the elevator as well as leaving the car at home more often. The solution to America's and the world's killer diet is not popping a prescription or over-the-counter pill. It is attacking the root of the problem, and removing it. 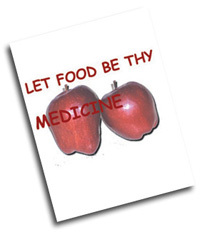 New E-book now available Let Food Be Thy Medicine. The title of this manual is from the famous saying of Hippocrates in 400 bc. The full quote is “Let your food be your medicine, and your medicine be your food.” Hippocrates is known as the father of modern medicine. The foods which constitute the standard American diet (SAD) lack the ability to supply essential nutrients, let alone be medicine for a sick body. Whole foods such as wheat and other grains, and fruit are processed to such a degree that dietary nutrients and fiber are removed. Examples are white rice, white bread, and fruit drinks. These processed products are inadequate to supply the human body with the nutrients it needs just to sustain itself. Even though the majority of Americans are eating more than enough calories, they are empty calories. People are literally starving themselves to the point that the body is highly susceptible to attack by disease. Their immune systems are undernourished and not capable of fighting chronic illnesses. By following the information given in this manual you will slowly nourish your body with the wholesome nutrients it needs to maintain, repair and build itself. Instead of calorie dense foods you will be consuming nutrient dense foods. You will put yourself on the road to strength, vigor, and vitality–no matter what your age. Price: $21.95.